Architect turned designer <a href="http://www.degercengiz.com/" target="_blank">Deger Cengiz</a>’s lighting pieces are works that thoughtfully fuse art and design. 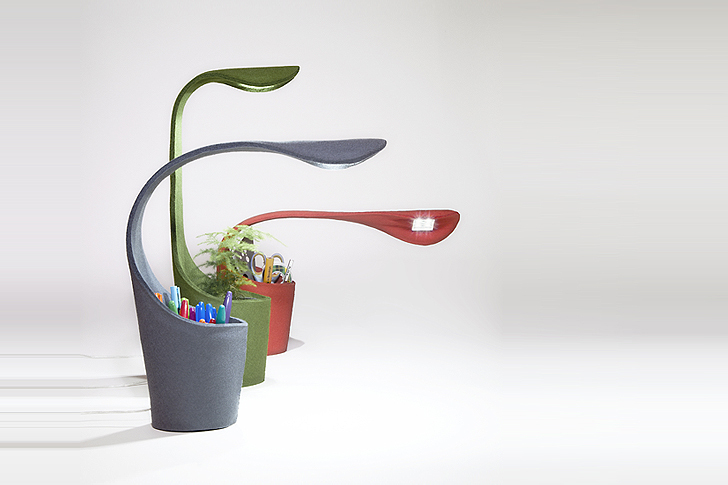 On display at the Wanted Design Show at <a href="https://inhabitat.com/new-york-design-week/" target="_blank">New York Design Week</a>, the design veteran’s quirky Dino Desk Lamp holds true to his style; combining a functional task lamp with a plant pot (or pen holder, depending on your preference). 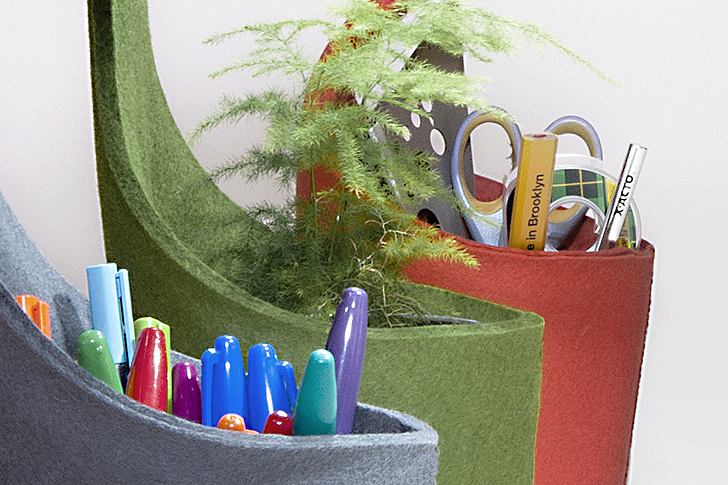 Made of <a href="https://inhabitat.com/ross-menuezs-icosa-lamp-gives-recyclable-felt-a-crystalline-form/" target="_blank">recyclable felt</a>, the Dino Lamp has a multi-functional container base to store your goodies -- including the leafy green kind! 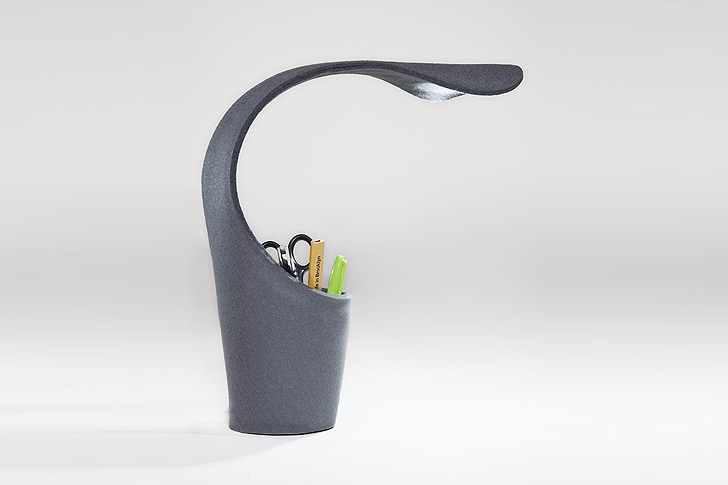 Dino’s flexible neck can be angled and bent in any direction for your lighting needs. A <a href="https://inhabitat.com/switch-announces-worlds-first-100-watt-equivalent-led-bulb/" target="_blank">bright LED bulb</a> ensures long lasting bright white- and energy efficient- illumination. Available in green, grey and red, the <a href="https://inhabitat.com/joey-roth-creates-computer-mouse-made-from-felt/" target="_blank">felt </a>covering is both cute and cozy, an unexpected element for a lamp. The best part, is the lamp’s base. Dino’s neck grows from a felt lined cup-sized container. The possibilities are endless! Store pens and markers, loose change, office supplies, even snacks. 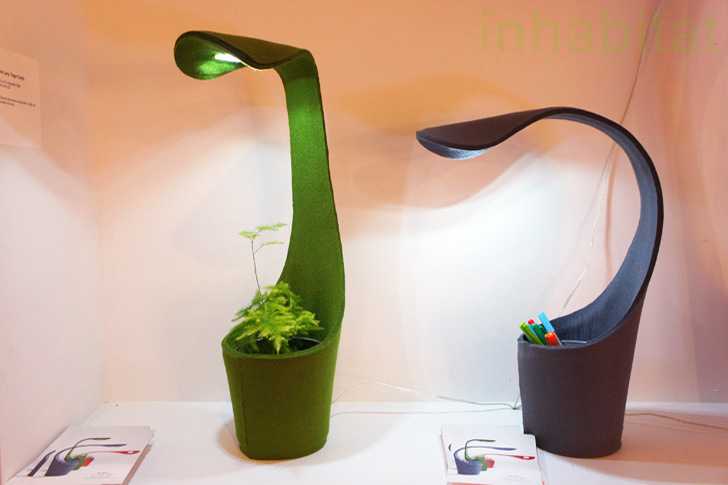 Or- even better- use the power of Dino’s <a href="https://inhabitat.com/joby-stathis-beautiful-lamp-transforms-into-a-rechargeable-flashlight/" target="_blank">LED</a> lamp to grow your own mini eco-system! Small ferns or cacti can turn Dino into a living lamp- just don’t forget to use a water tight <a href="https://inhabitat.com/cool-planting-pots-made-from-recycled-tires/" target="_blank">planter</a>. 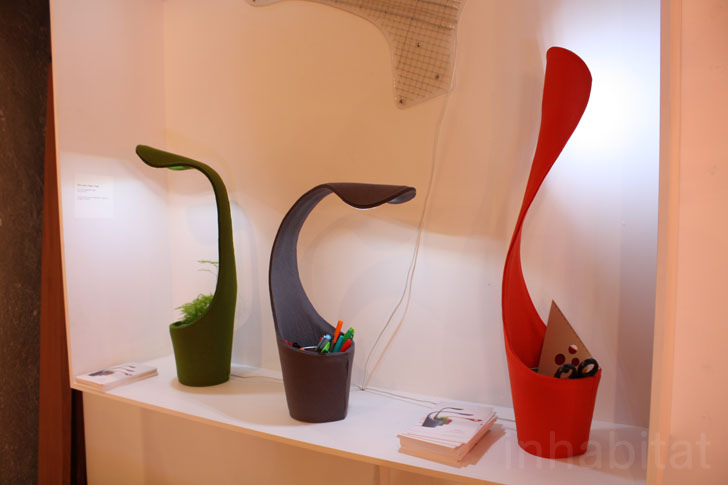 If you didn’t make it to <a href="https://inhabitat.com/icff" target="_blank">ICFF</a>, don’t worry, the Dino desk lamps are also available at Brooklyn’s innovative <a href="http://www.voosfurniture.com/" target="_blank">Voos Furniture</a>, located in Williamsburg. Architect turned designer Deger Cengiz’s lighting pieces are works that thoughtfully fuse art and design. 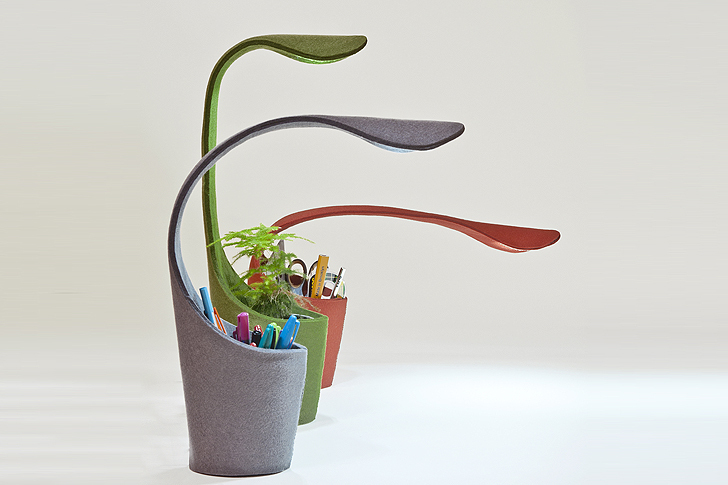 On display at the Wanted Design Show at New York Design Week, the design veteran’s quirky Dino Desk Lamp holds true to his style; combining a functional task lamp with a plant pot (or pen holder, depending on your preference). Made of recyclable felt, the Dino Lamp has a multi-functional container base to store your goodies -- including the leafy green kind!